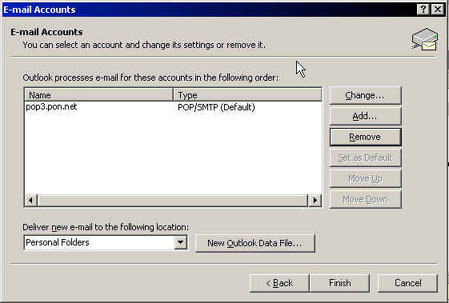 These instructions will guide you through the process of setting up Outlook 2002. 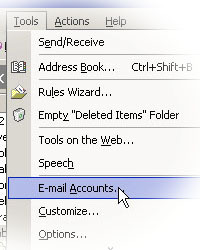 In Outlook 2002 go to the "Tools" menu, then select "E-mail Accounts". On the E-mail Accounts screen click the dot next to "Add a new e-mail account" then click Next. If you need to come back to your account at a later time to edit information you would click the dot next to "View or change existing e-mail accounts". If you will only be checking your email from one location then click the dot next to "POP3". 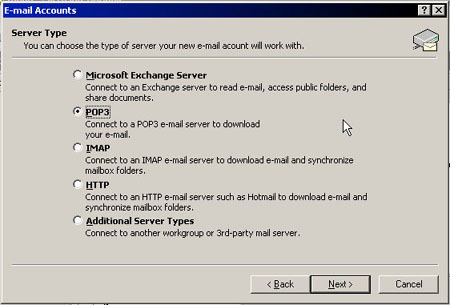 If you wish to check your email from multiple locations (such as home and work) then you will want to set Outlook to leave your email on the server so you will want to select "IMAP". Pacific Online does not use any of the other options so do not use any of the other options unless you have been specifically instructed to by a Pacific Online Technician. In the first box labeled "Your name" type in either your full name or your email address, whichever you prefer. Whatever you type in here is what people will see when they receive emails from you as to who the email is from. For example if you put your full name is this box and send someone an email, when they get that email and look to see who it is from they will see your full name. In the "E-mail Address" box enter your full Pacific Online email address, all lower-case with no spaces before, after, or inside the email address. 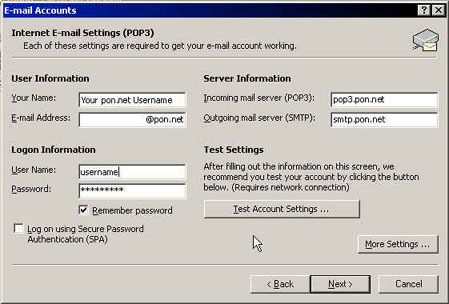 In the "Incoming mail server (POP3)" box enter "pop3.pon.net"; all lower-case, no spaces, and no quotes. 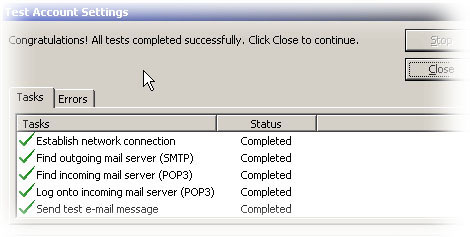 If you are setting up an IMAP account you still use the pop3.pon.net server, though this box may be labeled "Incoming mail server (IMAP)". In the "Outgoing mail server (SMTP)" box enter "smtp.pon.net"; all lower-case, no spaces, and no quotes. If you do not use Pacific Online as your primary internet connection you will need to use the outgoing mail server of the connection provider you are using as we do not allow non-Pacific Online connections to send mail out through our server. For the User Name enter in your Pacific Online email address but do not put the @pon.net portion. For the Password box simply enter your email account password. You cannot change your email password from here, you will have to either let us know that you want to change your account password, or if you just want to change your email address password you can do so by logging into email.pon.net from a web browser (Internet Explorer or Netscape as an example) then going to "Set my Preferences" then to "Change my password". If you are already online while you are setting up your email, we recommend hitting the "Test Account Settings" button to make sure that everything you entered in this window works correctly. If everything went through okay and your settings are correct, you should see a screen that looks something like the screenshot below. If some or all of the tasks have a red "x" beside them, click the Errors tab to see what is wrong with the settings you entered. If you got all green check boxes then you setup the preferences window correctly so all you need to do is hit "Close" to return to the E-mail Accounts window. After you have successfully entered all the information on the E-mail Accounts window and tested the information to make sure it is all entered correctly, click the Next button to continue. If you are finished with setting up your email address simply click Finish to close this window and return to Outlook 2002 and your email will be ready to use. 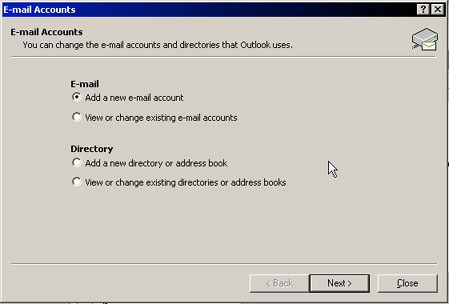 If you have more email accounts to setup in Outlook click the Add button and run through the setup instructions again for the new email address.